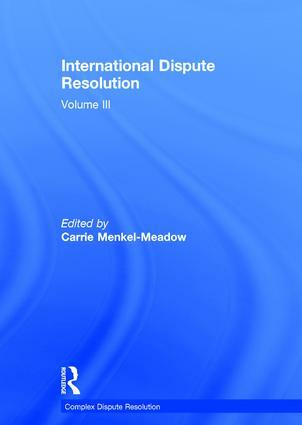 This volume considers the application of dispute resolution theory and practice to international conflicts and explores the uses of formal processes such as diplomacy or treaty formation, as well as more informal processes such as multiple-track private negotiations or peace workshops. The volume also presents materials on more innovative forms of complex transnational or sub-national conflict resolution, such as transitional and restorative justice institutions and processes, both formal (truth and reconciliation commissions) and indigenous and informal (Rwandan gacaca). The articles are selected from both public and private international law settings and query whether universal principles of multi-national dispute resolution are possible or whether each conflict is likely to be sui generis or requiring deep contextual analysis and integrity. They also explore the dialogic, as well as dialectical, relationships in the development of conflict resolution theory and practice in multi-cultural and multi-disciplinary settings and show that the application of dispute resolution theories from multiple sources and cultures (both Western and Eastern, as well as Northern and Southern) to multiple sites of conflicts (including courts, tribunals and other forms of dispute resolution at different levels and from multiple jurisdictions) raises important dilemmas of universalism and particularism in international conflict resolution.